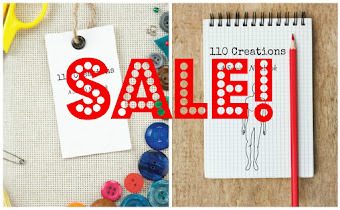 *Did you see yesterday's announcement about the newly-sized Sewist's Notebook? A slow mailman required that I posted in the afternoon. Scroll down in case you missed it! It's hard to believe that Thanksgiving is only a week away. Although, I'm not hosting, so it's pretty low-stress for me (thanks to my Mom and mother-in-law for both hosting!). 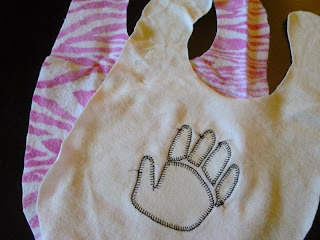 Today I have a project and tutorial for a cute memento to help you celebrate baby's first (or second!) Thanksgiving. 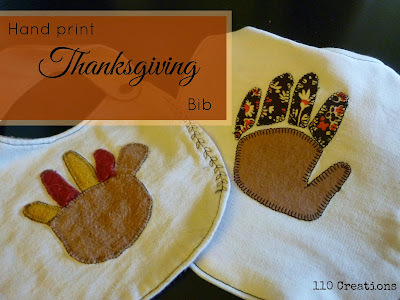 Last year I made a bib for AB for her first Thanksgiving (above picture, bib on the left). She was too young for any typical Thanksgiving crafts, so I decided to trace her little hand and craft on her behalf. I loved the first bib so much that I decided to make another this year. Want to make your own? It's easy, I promise! A note about fabrics: A non-stretch (woven) fabric will be easier to sew, but there is no reason you can't use a stretch fabric for any part of this bib. Both of my examples use a stretch terry cloth for the front, with a non-stretch flannel for the back. 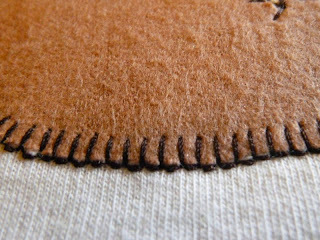 The appliqué pieces are made from wool and knit scraps. 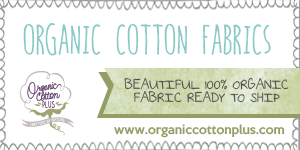 When in doubt, go with cotton flannel. 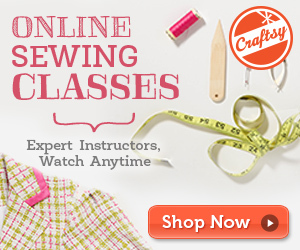 It's very easy to sew and washes well. The first step is the hardest: trace baby's hand onto paper. 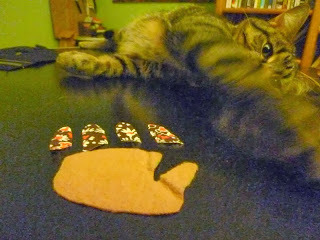 It works best if the fingers are spread out, but AB was NOT a willing participant so I took what I could get. Using colored pencils, color-code your appliqué pieces. I wanted the body/palm to be joined to the head/thumb so that it's all one piece. 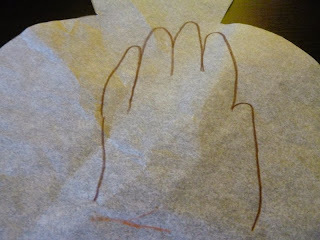 Fill in any spaces between the fingers that your unwilling child wouldn't let you trace around. 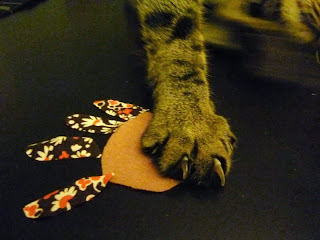 Cut appliqué pieces from paper. 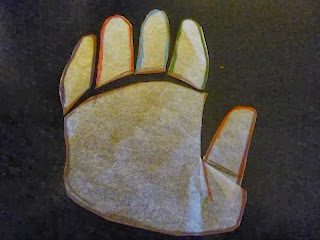 Because AB's fingers weren't spread, I slashed the thumb away and sort of tilted it to achieve the look I wanted. Here you can see where I overlapped the pieces. 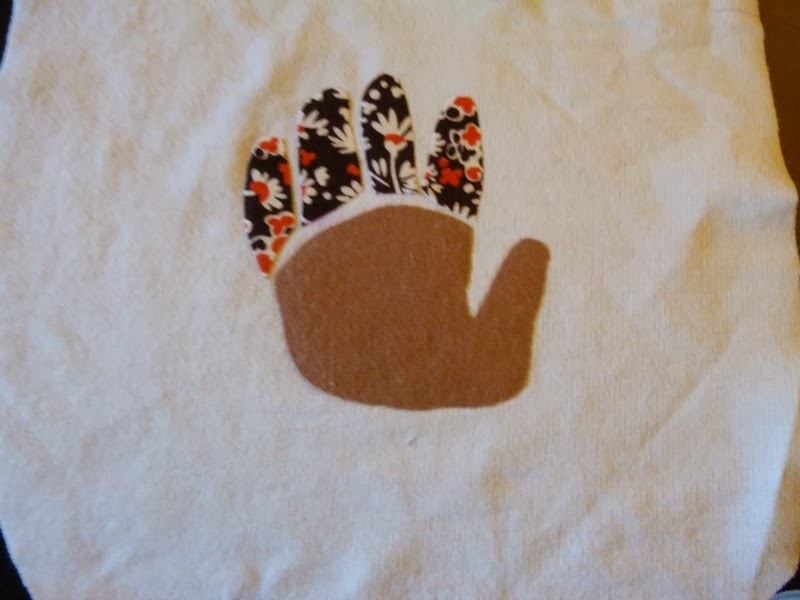 Trace paper template pieces onto fabric, and cut out fabric pieces. You can use whatever scraps you have for the body and feathers. You can see that both of my bibs used different fabrics for the feathers, just for fun. Dig through your scrap box and see what you can come up with! Optional step: allow your cat to swat at your pieces. 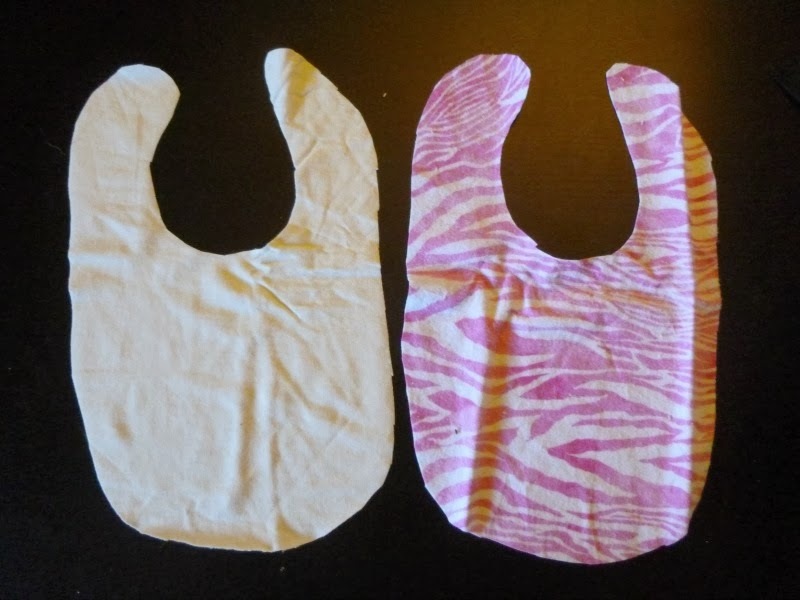 Pull out the bib you want to copy, and lay it completely flat on your bib fabric. Trace two bib pieces (front and back). 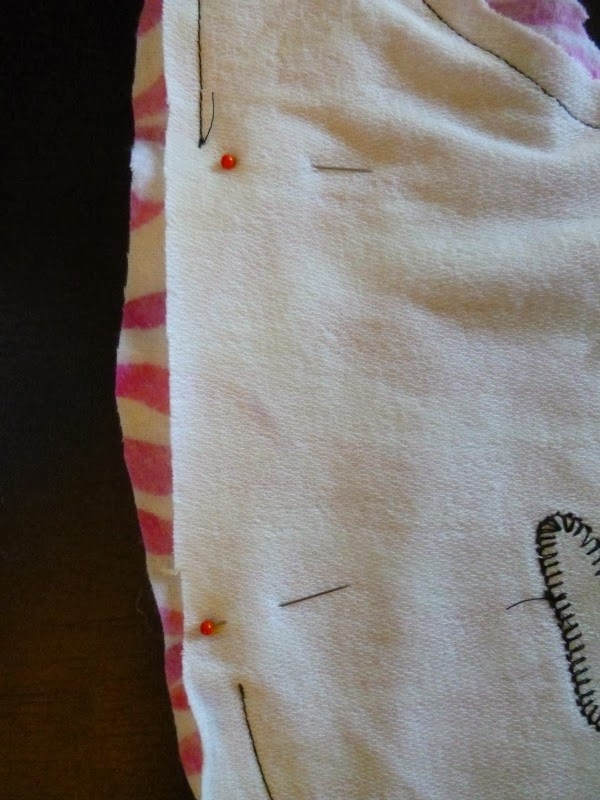 Remember to add some extra all around the bib for seam allowance. 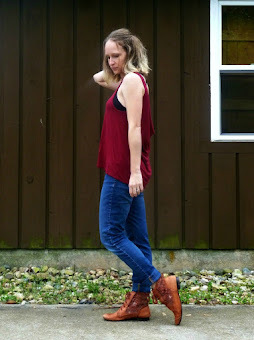 Cut out these two pieces. Set aside the back bib piece for now. 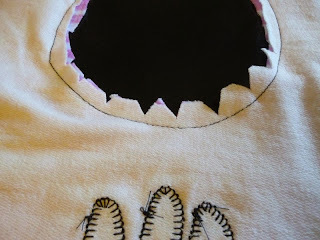 If you happen to have some Wonder Under (fusible webbing) at your disposal, I recommend using it to adhere the appliqué pieces to the front of the bib. 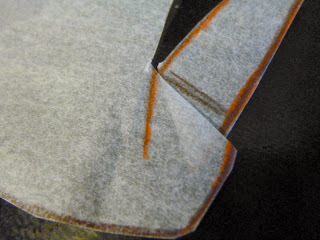 The fusible web will hold the pieces down so you can sew around them more easily. If you don't have any on hand, a quick swipe from a glue stick can also keep things in place. 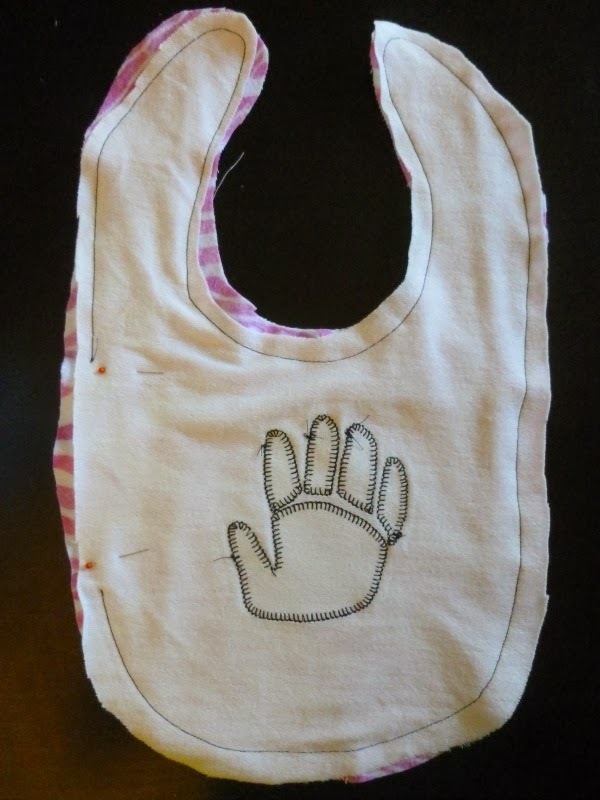 Determine placement of the appliqué on your front bib piece, and keep in place using either method above. 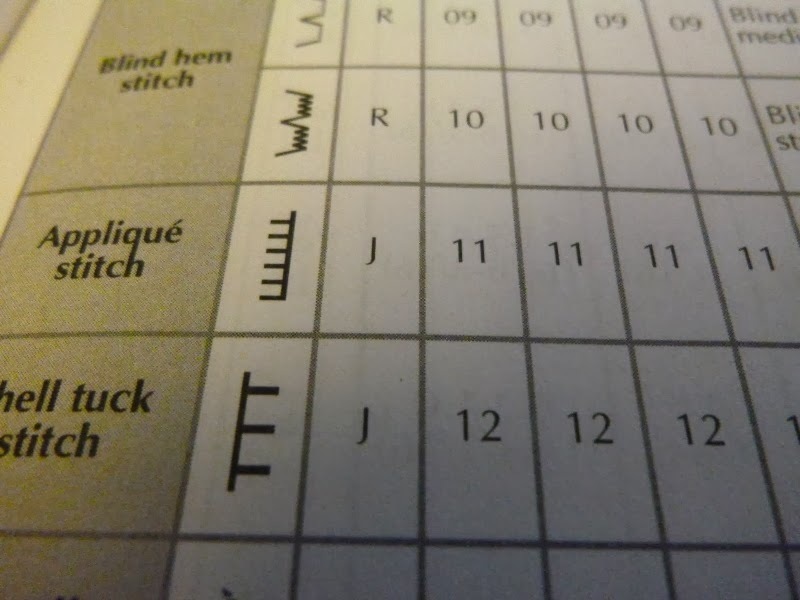 Select an appliqué stitch on your machine. For me and my Brother CS-6000i, that's stitch #11. 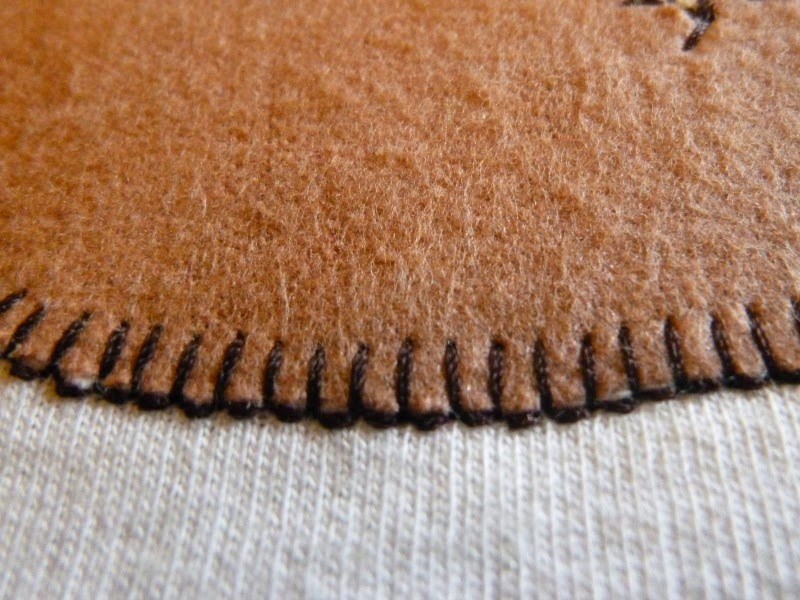 If your machine doesn't have a stitch like this, you can use a zig-zag. If you've never used your appliqué stitch before, I highly recommend practicing on scraps. 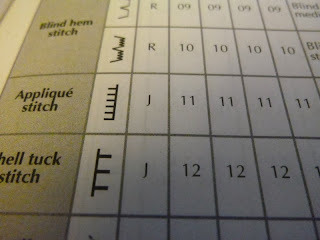 Since we'll be sewing around lots of curves, it helps to be familiar with how the stitch is formed. 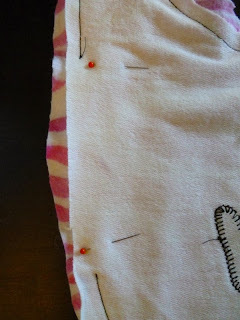 Going slowly, sew around each piece, tying off your threads when you're done. The hardest part is done! Next, take your front bib and back bib and pin them together, with right sides facing. 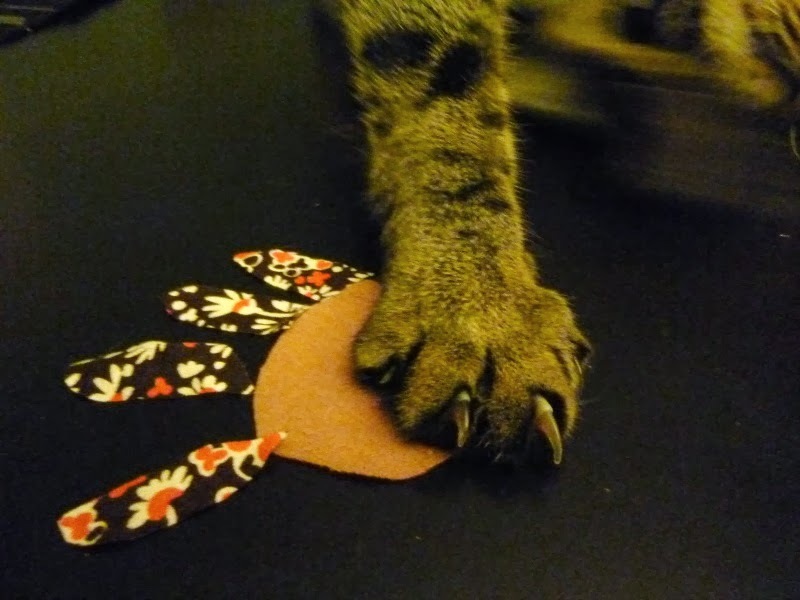 Be sure to use whatever seam allowance you decided when originally tracing. It's not an exact science, this IS a bib after all! Hopefully it will soon be covered in mashed potatoes and pumpkin pie. IMPORTANT: leave an opening! 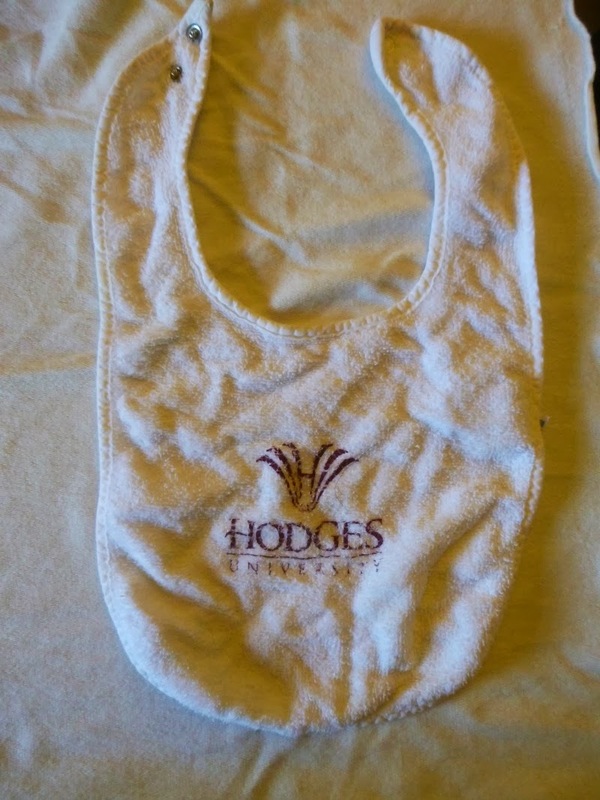 You must be able to turn the bib right-side out. It's best for the opening to be along the side where it is relatively straight. I like to use two red pins (red for STOP!) to remind myself not to sew the opening closed. 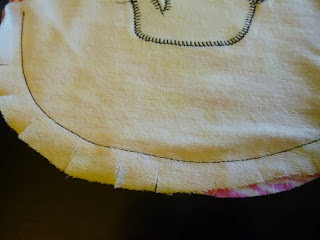 Before turning the bib right-side out, you need to use your scissors to clip the concave curves and notch the convex curves. This will allow the bib to properly lie flat. In both cases, be very careful not to cut the stitching! Once all your cutting is done, turn the bib right-side out through the hole you left. 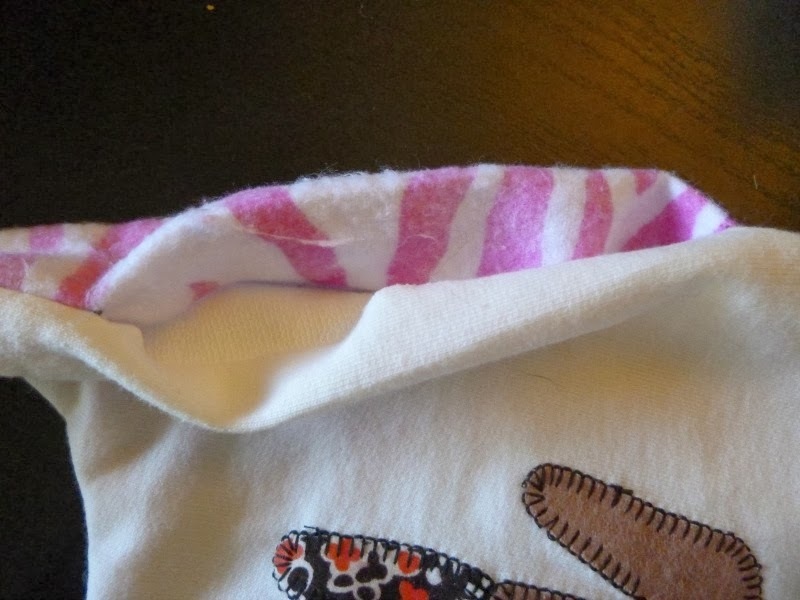 Tuck the seam allowances from the hole inside the bib and press the whole thing flat. 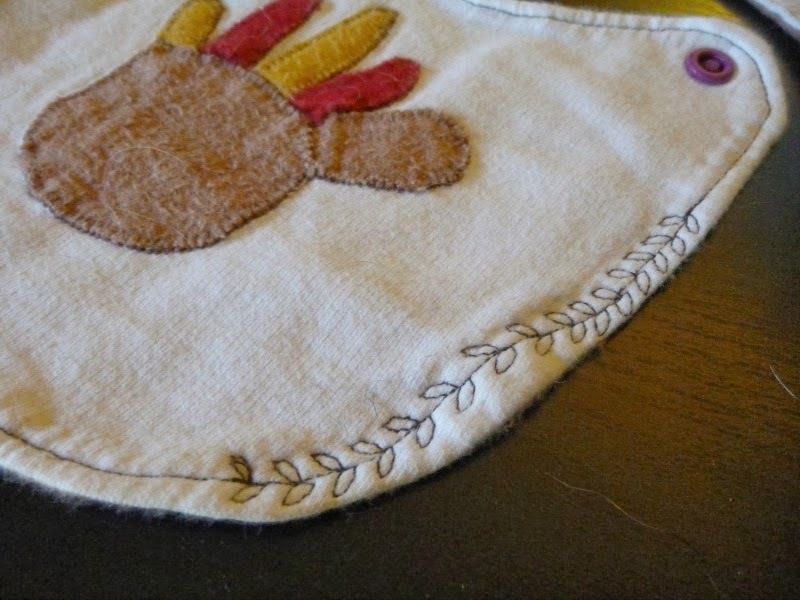 To secure the open hole and tidy things up a bit, topstitch around the entire bib. Press again. 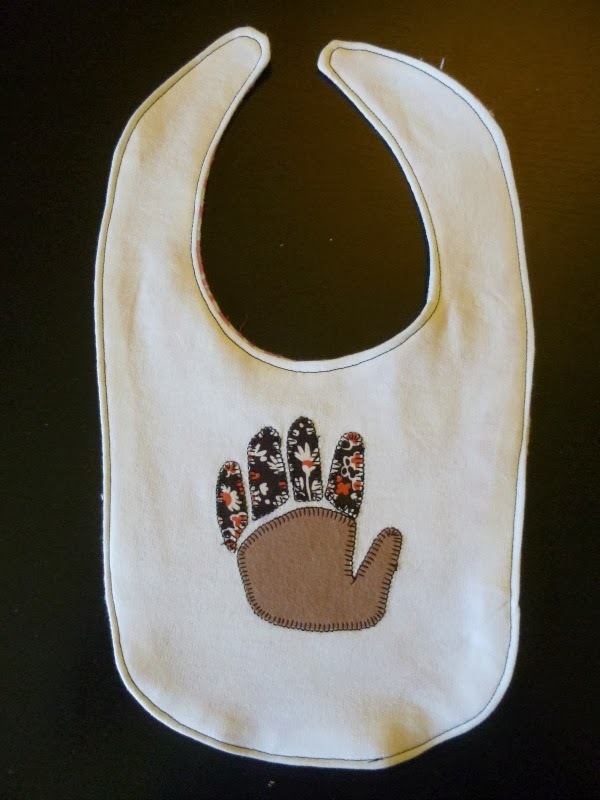 For the bib I made last year, I incorporated some of my fancy embroidery stitches. Just be aware that these stitches can be hard to do around curved and/or narrow areas. 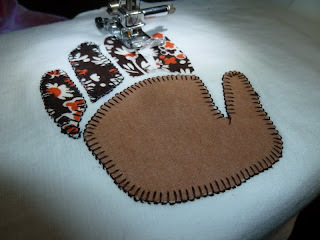 The final step is to add a closure. 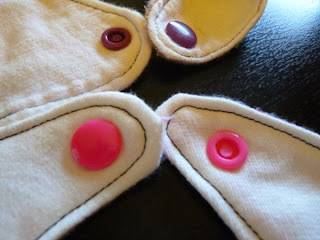 For both of my bibs, I used KAM snaps, but you can use sew-on snaps, Velcro, or even sew on a button and make a buttonhole. That's it! Imagine how fun these would be with your child's name embroidered on it, the date, or even a phrase like "Happy Thanskgiving!". 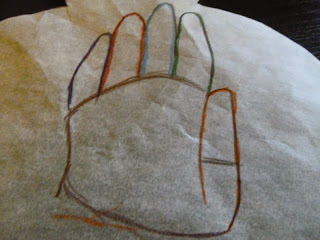 What a fun way to remember a holiday and exactly how big (or little!) your child was. Questions? Ask in the comments! 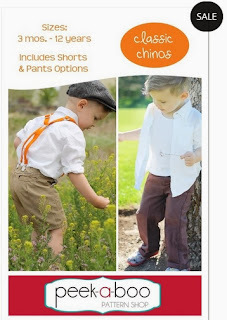 Today's Thrifty Thursday deal is the Classic Chinos pattern! Great for girls or boys. 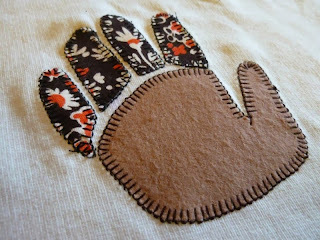 Head over to Peek-a-Boo Pattern Shop to get this versatile pattern for only $4!